For practical, energy efficient, and cost-effective engineering solutions, call on Khanatek. Our friendly team of experienced engineers delivers electrical engineering, structural engineering, mechanical engineering, and project management services to clients throughout Alberta, Canada. From project costing and planning through to electrical design, structural design, mechanical design, and project management, Khanatek will take the worry out of your next engineering project. 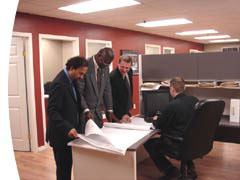 Take a "one-stop shopping" approach and engage our integrated design team, or choose the specific services you need. Engage services on a per-project basis, or enter into an ongoing consulting relationship. Because Khanatek focuses on small-to-medium sized projects, you're assured of prompt, personalized service. Count on Khanatek for safe, practical, and cost-effective solutions that meet all relevant regulatory requirements and inspection standards. Why Not Consider a "Green" Design? Going "green" can pay. As members of the Canada Green Building Council, Khanatek is committed to developing energy efficient, environmentally friendly designs that minimize operating costs. If you're interested in qualifying for one of the Incentive Programs offered by Natural Resources Canada, or in LEED certification, contact Khanatek. We'll be pleased to show you how going "green" can put dollars in your pocket. Khanatek particularly welcomes architects who are interested in implementing their building designs in an energy-efficient, sustainable way.